If your workplace hasn’t started embracing appreciating benefits of chair massage, then know that you and your colleagues still have a long way to go. Let’s face it, no one really likes the work that we have to do, but for the sake of money we earn, we work. The boredom at workplaces has prompt many employers to adopt means to make their employees livid and lively. I’m sure you’ve heard of workers advocating for the better working environment, I’ll call chair massage a luxury at the workplace that brings motivation to employees. Realistic employers can go to the extent of breaking their bank to make workers comfortable thus increased production in their firms. When you seek the services of trained therapists at your company to massage your workers, it produces immediate and good results. The massage session can run for a period of 10-20 minutes every day and with the aid of chair massage for a speedy yet an effective massage. The massage should target regions of the body that get strain while working. Such areas include; shoulders, ankle, neck, and arms. The immediate positive results come because of reduced blood pressure, improved attention and heightened creativity that chair massage brings. They say that too much work without play makes Jack a dull boy, do not think that the proverb is only applicable to children. The work can be too much that it adds pain to the body of your workers, but a simple massage can work a miracle such times. Chair massage can enhance quicker healing of the strained muscles, improves the health of the skin, alleviate headaches and eye strain. The end result will be improved posture and better posture of the workers. The main purpose that can make an employer to place a massage chair at a workplace is to enhance increased productivity and not for luxury. The pain that chair massage reduces and the positive mood that it instills will make any worker do more work than usual even with the absence of supervision. Arriving at work to find piles of work waiting for you can increase tension in your mind. The expectations and the goals that your employer has set for you can make you feel like going mad. Another thing that can contribute to tension in workers is when they have to beat deadlines in their service delivery. Chair massage works well in reducing tension and anxiety and help workers to remain focused in their duties. Anxiety and tension are emotional conditions that do not need any physical medication to heal but only require a massage that brings the natural healing. I know you’re wondering how the better sleep of a worker can be an employer’s business, but I’m going to make you know why it’s necessary. Of course, the company doesn’t provide massage services for workers to sleep at work, chair massage help workers to sleep soundly when they return to their respective homes. When workers get a massage from the trained therapists, they sleep with ease at their homes thus limiting their chances of sleeping while at work. It should be the duty of any sensible employer to ensure that his/her workers come back to work when in sound condition to work. Chair massage eliminates drowsiness at work thus enhancing effectiveness at the workplace. No company is ready to put up with constant sick leave that workers request when their health conditions aren’t in the right shape. Chair massage enhances proper blood circulation and improved function of the lymph system thereby helping in eliminating toxins from the body. When the immune system works well, it ensures that workers can overcome seasons with extreme weather conditions. Extreme weather conditions can result in cold and other physical ailments that can increase absenteeism at work. The benefits of chair massage for seniors at work are more than not having a massage at all. The overall happiness that chair massage puts on workers is high, and truly that’s what’s needed the good working attitude. In fact, massage in the workplace statistics indicates that when you avail chair massage for the staff, the motivation level increases to the peak. What’s a site chair massage? Even before having a massage, many people know of table massage and all that it entails because it’s popular. Chair massage or seated massage is a kind of massage that a therapist does on a client who is uprightly seated on a chair and in clothes. This is a seated relaxation massage that therapists conduct with the aid of a specially designed chair either at homes or at places of work. The special chair is always comfortable for both the therapist and the client as it allows for multiple reclining positions thus reducing instances of straining. The chair makes it easy for a therapist to work on position with tight and painful. The positions are mainly; the neck, the arm, the back and the hand. The massage happens when the client is in clothes, therefore, doesn’t require the use of lotions or oils. Very convenient as it doesn’t require one to remove clothes. The chair is portable thus allowing the massage both at home and offices. Doesn’t take much time since it mainly runs for 15-20 minutes. Have full benefits of natural wellness. Highly effective because it involves the combination of techniques including both the eastern massage and the Swedish massage. It sometimes involves hand and feet reflexology. Cheap because you don’t have to buy lotions or other ointments. They can have the massage even while on wheelchairs. Works on the target points. Convenient as it can be conducted at any place. The elderly is shy of removing their clothes, and chair massage never betrays their fear. No company can thrive without human resource, and several studies indicate that lack of good working environment lowers worker’s productivity. It’s for this reason that every aggressive employer should take advantage of chair massage and avails it to the staff. 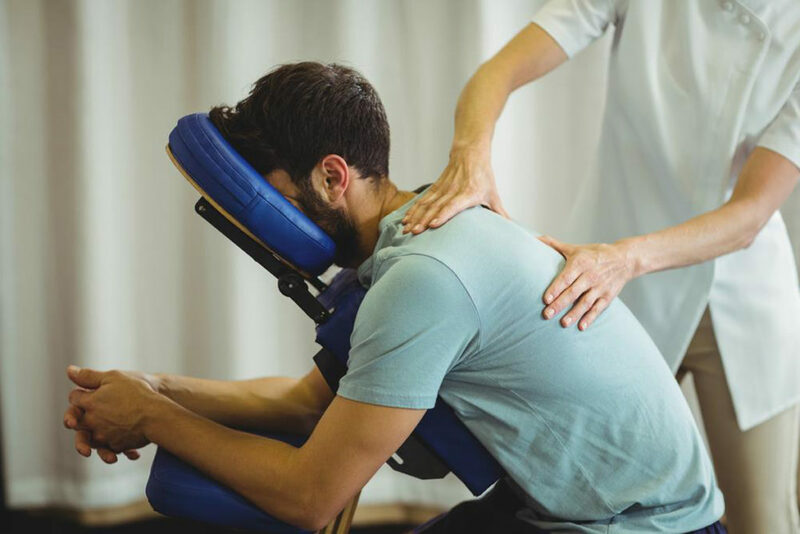 The benefits of chair massage are massive, and most of the benefits are natural and healthy for the workers’ well-being. It’s no doubt that massage at work makes workers develop enthusiasm for their tasks and feel motivated thus quality work delivery. The increase in productivity comes as a result higher creativity that massage enhances.